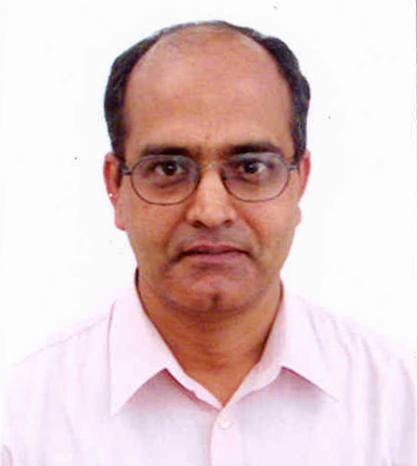 Dr. Vijay Kumar obtained his PhD from All India Institute of Medical Sciences, New Delhi and received post-doctoral training at the University of Louis Pasteur, France. He was involved in the cloning of human estrogen receptor gene, solving its domain structure and establishing how hormone induces allosteric change for its DNA binding. Further, he showed the importance of receptor variant analysis in the management of breast and prostate cancer patients. Thereafter, he had an illustrious career as a staff scientist at the International Centre for Genetic Engineering and Biotechnology, New Delhi where he investigated the role of X protein of hepatitis B virus (HBx) in abetting oncogenic activities leading to hepatocellular carcinoma (HCC). His work has shown that HBx can deregulate cell cycle by modulating CDK2 activity and mitogenic signaling, inducing ribosome biogenesis and even engaging cellular DNA replicative machinery - all working in tandem towards cell transformation. He developed India’s first HBV-related transgenic oncomouse model of HCC which has helped in understand disease biology as well as screening anticancer agents. He has more than 110 International publications to his credit, including Nature, Cell, EMBO Journal and Journal of Biological Chemistry with a cumulative 10,000 plus citations. Dr. Kumar is a fellow of the National Academy of Medical Sciences as well as elected fellow of National Academy of Sciences and National Academy of Agricultural Sciences. He is also a recipient of Shanti Swarup Bhatnagar Prize in Medical Sciences for his scientific contributions in the field of Hepatitis B Virology. His current research interests include development of new antivirals for hepatitis B virus and epigenetic regulation of viral cccDNA for therapeutic targeting. He is an active member in many Institutional committees and presently also serving as Dean (Academic). 1972 ‘Kul Prize’ for Best Science graduate, Bhagalpur University, Bhagalpur. 1977 Gold Medal for securing first rank in M. Sc., Magadh University, Bodh-Gaya. 1982-84 Lady Tata Senior Research Scholarship, Lady Tata Memorial Trust, Mumbai. 1998 Gold Medal, Zoological Society of India. Kapoor, N.R., Chadha, R., Kumar, S., Choedon, T., Reddy, V.S. and Kumar V (2017). The HBx gene of hepatitis B virus can influence hepatic microenvironment via exosomes by transferring its mRNA and protein. Virus Res 240, 166-174. Ahuja, R. and Kumar, V. (2017). Stimulation of Pol III-dependent 5SrRNA and U6 snRNA gene expression by AP-1 transcription factors. FEBS J 284, 2066-2077. Subramaniyan, B., Kumar, V. and Mathan, G. (2017). Effect of sodium salt of Butrin, a novel compound isolated from Buteamonosperma flowers on suppressing the expression of SIRT1 and Aurora B kinase-mediated apoptosis in colorectal cancer cells. Biomed Pharmacother 90, 402-413. Rajput, P., Pandey, V. and Kumar, V. (2016). Stimulation of ribosomal RNA gene promoter by transcription factor Sp1 involves active DNA demethylation by Gadd45-NER pathway. BiochimBiophysActa 1859, 953-963. Sidhu, K. and Kumar, V. (2015). c-ETS transcription factors play an essential role in the licensing of human MCM4 origin of replication. BiochimBiophysActa 1849, 1319-1328. Pandey, V. and Kumar, V. (2015). Stabilization of SIRT7 deacetylase by viral oncoproteinHBx leads to inhibition of growth restrictive RPS7 gene and facilitates cellular transformation. Scientific Reports 5, 14806. DOI: 10.1038/srep14806. Jamal, A., Swarnalatha, M., Sultana, S., Joshi, P., Panda, S.K. and Kumar, V. (2015). The G1 phase E3 ubiquitin ligase TRUSS that gets deregulated in human cancers is a novel substrate of the S-phase E3 ubiquitin ligase Skp2. Cell Cycle 14, 2688-2700. Ahuja, R. Kapoor, N.R. and Kumar, V. (2015). The HBxoncoprotein of Hepatitis B virus engages Nucleophosmin to promote rDNA transcription and cellular proliferation. BiochimBiophysActa 1853, 1783-1795. Rajput, P., Shukla, S.K. and Kumar, V. (2015). The HBxoncoprotein of hepatitis B virus potentiates cell transformation by inducing c-Myc- dependent expression of the RNA polymerase I transcription factor UBF. Virol. J. 12, 62. DOI 10.1186/s12985-015-0293-5. Nosrati, N., Kapoor, N.R. and Kumar, V. (2015). DNA damage stress induces the expression of Ribosomal Protein S27a gene in a p53-dependent manner. Gene 559, 44-51. Choedon, T., Mathan G., and Kumar, V. (2015). The traditional Tibetan medicine YukyungKarne exhibits a potent anti-metastatic activity by inhibiting the epithelial to mesenchymal transition and cell migration. BMC Complement. Altern Med. 15, 182. Choedon, T., Dolma, D., Mathan G., and Kumar, V. (2014). Molecular insights into the anti-cancer properties of Traditional Tibetan medicine YukyungKarne. BMC Complement. Altern Med. 14, 380. Saxena, N., and Kumar V. (2014). The HBxoncoprotein of hepatitis B virus deregulates the cell cycle by promoting the intracellular accumulation and re-compartmentalization of the cellular deubiquitinase USP37. PLoSOne 9, e111256. Sidhu, K., Kumar S., Reddy, V.S., and Kumar V. (2014). Mass spectrometric determination of disulfide bonds in the biologically active recombinant HBx protein of hepatitis B virus. Biochemistry 53, 4685-4695. Nosrati, N., Kapoor, N.R. and Kumar, V. (2014). Combinatorial actions of transcription factors orchestrate a cell cycle-dependent expression of the ribosomal protein genes and ribosome biogenesis. FEBS J. 281, 2339-2352. Swarnalatha, M., Singh, A.K. and Kumar, V. (2013). Promoter occupancy of MLL1 histone methyltransferase seems to specify the proliferative and apoptotic functions of E2F1 under tumour microenvironment. J. Cell Sci. 126, 4636-4646. Kapoor, N.R., Ahuja, R., Shukla, S.K. and Kumar, V. (2013). The HBx protein of Hepatitis B virus confers resistance against nucleolar stress and anti-cancer drug-induced p53 expression. FEBS Lett. 587, 1287-1292. Swarnalatha, M., Singh, A.K. and Kumar, V. (2012). The epigenetic control of E-box and Myc-dependent chromatin modifications regulate the licensing of lamin B2 origin during cell cycle. Nucl. Acids Res. 40, 9021-9035. Pandey, V. and Kumar, V. (2012). The HBx protein of hepatitis B virus promotes re-initiation of DNA replication by regulating the expression and intracellular stability of replication licensing factor CDC6. J. Biol Chem. 287, 20545-20554. Shukla, S. K. and Kumar, V. (2012). HBx and c-myc cooperate in the up-regulation of ribosome biogenesis and in cellular transformation. FEBS J. 279, 3859-3871. Khattar, E., Mukherji, A. and Kumar, V. (2012). Akt augments the oncogenic potential of the HBx protein of hepatitis B virus by its phosphorylation. FEBS J. 279, 1220-1230. Fatima, G., Mathan, G. and Kumar, V. (2012). The HBx protein of hepatitis B virus regulates the expression, intracellular distribution and functions of Ribosomal Protein S27a. J. Gen. Virol. 93, 706-715. Sidhu, K. and Kumar, V. (2015). DNA replication: Old game, New players. J. Biochem. Mol. Biol. Res. 1: 14-20. doi:10.6051/j.issn.2313-7177.2015.01.7. Pandey, V. and Kumar, V. (2014). Breast Cancer care – It’s time to rethink and redesign. J. Clin. Exp. Pathol. 4, 1000e118. Kapoor, N.R. and Kumar, V. (2014). Emerging Role of Exosomal Secretory Pathway in Human Tumour Virus Pathogenesis. Int .J. Biochem. Res. Rev. 4, 653-665. Ahuja, R., Jamal, A., Nosrati, N., Pandey, V., Rajput, P., Saxena, N., Sidhu, K., and Kumar, V. (2014). Human Oncogenic Viruses and Cancer. Curr. Science 107, 768-785. Kumar, V. and Sahal D. (2014). Genetic Engineering. In: Ullmann’s Encyclopedia of Industrial Chemistry (Ed. B. Elvers), Wiley-VCH Verlag GmbH & Co., Germany, p. 1-79. Saxena, N. and Kumar, V. (2013) Oncogenic viruses: DUBbing their way to cancer. Virol. Discov. doi: 10.7243/2052-6202-1-5. Kapoor, N.R. and Kumar, V. (2012). Hepatitis B virus – A molecular perspective. Proc. Natl. Acad. Sci. India, Sect B, Biol. Sci. 82, 31-41.